Life with Kozo - 04/02/03 - "Farewell Leslie"
First, an apology. The title of the LoveHKFilm.com webmaster column is Life with Kozo, but this topic is much greater than some silly words from some guy who happens to watch a lot of Hong Kong movies. I didn't intend to use this space to cover topics this serious, but when something like this happens, I find it hard to just let things go with a four-sentence blurb on the home page. Sometimes you want to say more. And, sometimes people actually e-mail you and ask for more than a four-sentence blurb. And really, this subject deserves more than just four sentences. On April 1st, 2003, Leslie Cheung Kwok-Wing died of an apparent suicide. He leapt to his death from the Mandarin Oriental, a luxury hotel in Hong Kong's Central district. The reasons why are still unclear. A suicide note was reportedly found on his body, and the reasons bandied about by Hong Kong's notorious media include the end of a 17-year relationship, a difficulty reconciling with getting older, and extreme, acute depression. This event will undoubtedly be discussed in the weeks ahead, and some, all or none of the facts will eventually be known. This is the cycle of these things. For the Western fan of Hong Kong Cinema, Leslie Cheung has meant a great deal. He's been one of the most recognizable (and undeniably attractive) faces, and many of his films are certifiable Hong Kong Cinema classics. He's worked with many prominent Hong Kong directors: John Woo, Tsui Hark, Stanley Kwan, Peter Chan, Wong Kar-Wai. His career has been synonymous with Hong Kong's recent "Golden Age" of cinema. A Chinese Ghost Story, A Better Tomorrow, Rouge, Ashes of Time, Days of Being Wild, He's a Woman She's a Man, The Chinese Feast, Happy Togetherthese are more than just "good movies." To many, these films define that which made Hong Kong Cinema so special. And Leslie Cheung was undeniably a huge part of that. But personally, I cannot eulogize Leslie Cheung. I didn't know him personally, nor could I have any claim to knowing much about him. I only knew his movies. I've seen numerous films of his, and have had varying opinions on the films and his performances within. Though I cannot claim to be the biggest fan of Cheung's, I must say that I always found him to be a charismatic, interesting and above all powerful. 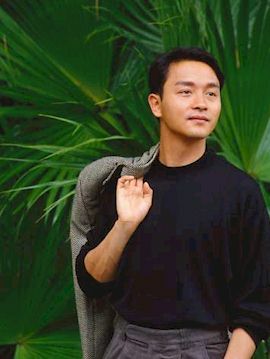 When I think Leslie Cheung, I think Days of Being Wild. I think Farewell My Concubine. I think Happy Together. Those were, in my mind, his finest performances, and in all those films he seemed to possess a self-destructive edge that was heartbreaking. Perhaps he found those performances inside his own pain and anguish. Maybe his selection of roles (his most recent ones have been disturbingly dark) came from the desperate emotions he was feeling. Who really can tell? Not me, that's for sure. Which brings me to this: I don't think I'm qualified in any way to say anything about Leslie Cheung's life or death. Even though people have asked me to say something, I can't even pretend that I'm qualified to do so. All I can say is how I feel about all of this. Personally, I feel sad. A little shocked. Disappointed. Bewildered. Sullen. Puzzled. And even angry. To live life is a tremendous gift. As hackneyed as it sounds, I truly believe that. And to throw all that away...it's just too sad for words. But who cares how I feel? Basically I'm nobody, and my views on life and death are incredibly suspect. I feel however way I feel about Leslie Cheung's passing, and that is something which I have difficulty putting in words. The more I try, the more it seems that I'll cheapen what his life was to so many people out there. And really, his life was about more than just himself. Leslie Cheung's death has triggered a wave of sympathy from fans, media and fellow entertainers alike. Many, many words can be found all over the web which fully demonstrate the ways in which Leslie Cheung has touched other people's lives. There is a beautiful thread over at the Mobius Asian Film Discussion Boards where people have taken the time to share just what Leslie Cheung meant to them. It's clear that he's become more than just one person. Entertainment legend or superstar are not the words I'm looking for. It's something else, which I can't quite put my finger on. He will be missed, that's for sure. Find an Asian Cinema board and ask around, and you'll find enough evidence of that. You'll see that he's meant a great deal to many, many people all over the world. His films, his music, and his very presence have influenced people in ways that one could never have imagined. If you can, find the time to take a look at what people to have to say. Listen to the feelings people want to share, about Leslie Cheung and anything else they might have on their minds. Because right now, in a world where things are uncertain and turbulent and just don't make any sense at all, the most important thing is how people feel. As for Leslie Cheung, I hope he's found peace. Hong Kongand indeed the worldhas lost a fine entertainer, and a truly unique human being. He deserves to find some measure of the peace he could not find while alive. And really, that's all I can say. Farewell, Leslie. Rest in peace. The opinions expressed within are merely the musings of the Webmaster, and as such should be taken with the requisite grain of salt. If you disagree with an expressed opinion please feel free to contact him here. If you feel he has insulted your favorite popstar, you can still contact him. However, your chances of receiving a reply will be reduced by half.